The quetzal is a bird that many consider among the world's most beautiful. Vibrantly coloured, they live in the mountainous, tropical forests of Central America where they eat fruit, insects, lizards, and other small creatures. The quetzal is a bird that many consider among the world’s most beautiful. During mating season, male quetzals grow twin tail feathers that form an amazing train up to one metre long. Females do not have long trains, but they do share the brilliant blue, green, and red coloring of their mates. 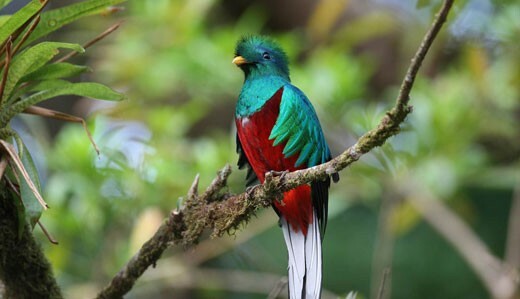 Quetzal pairs use their powerful beaks to hollow hole nests in rotted trees or stumps. Young quetzals can fly at about three weeks of age. Quetzals are also known as Guatemalan quetzals, and the birds are the symbol of that nation. The bird was sacred to the ancient Maya and Aztec peoples, and royalty and priests wore its feathers during ceremonies. These striking birds are threatened in Guatemala and elsewhere throughout their range. They are sometimes trapped for captivity or killed, but their primary threat is the disappearance of their tropical forest homes. In some areas, most notably Costa Rica’s cloud forests, protected lands preserve habitat for the birds and provide opportunities for ecotourists and eager bird watchers from around the globe.